President Trump said he told Brazilian leader Jair Bolsonaro he would designate the South American nation a major non-NATO ally and possibly go further by supporting a campaign to make Brazil “maybe a NATO ally,” as Reuters’ Lisandra Paraguassu and Roberta Rampton report. Acting defense secretary Patrick Shanahan identified all of the projects that could possibly be affected by President Trump’s decision to use emergency authorities to take up to $3.6 billion in military construction funds for his border wall, as the Washington Post’s Paul Sonne and Erica Werner report. Dive Deeper: Acting Defense Secretary Patrick Shanahan will deliver the keynote address tomorrow at CSIS’s "Strategic National Security Space: FY 2020 Budget and Policy Forum." Top U.S. and China negotiators are planning new rounds of talks starting next week to end a trade dispute between the two nations that has rocked markets globally as the WSJ’s Bob Davis reports. Dive Deeper: “Short-Term Pain, Long-Term Gain?” by CSIS’s Bill Reinsch. In the United States, terrorist attacks by far-right adherents have risen significantly over the past decade. Between 2007 and 2011, the number of far-right attacks in the U.S. was five or fewer per year. The number of attacks then rose to 14 in 2012, and eventually jumped to 31 in 2017. 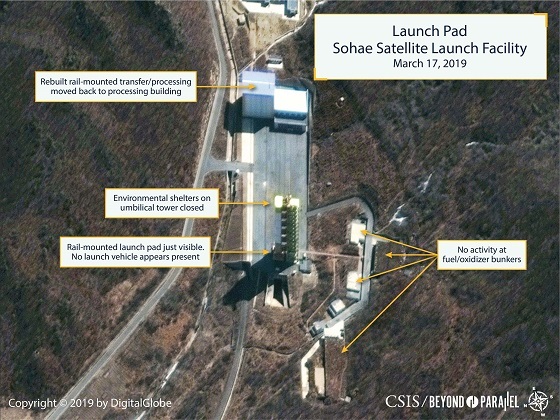 New satellite imagery shows no significant changes to the vertical engine test stand or launch pad at North Korea's Sohae launch facility since the last Beyond Parallel report was published 10 days ago. The Andreas C. Dracopoulos iDeas Lab at CSIS enhances our research with the latest in cutting-edge web technologies, design, and video. (Photo credit: Brendan Smialowski/AFP/Getty Images). 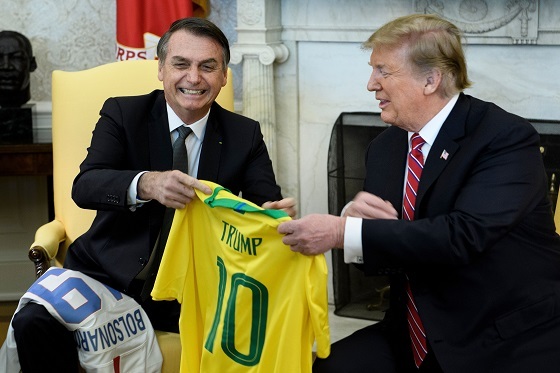 Brazil's President Jair Bolsonaro and U.S. President Donald Trump present each other with their national soccer team jerseys before a meeting in the Oval Office. “Turkey: Erdogan’s Struggle to Lift Flagging Business,” by the FT’s Laura Pitel. At 8:30 a.m., join CSIS for a forum on the national security space landscape and the release of the FY2020 budget, featuring Acting Secretary of Defense Patrick M. Shanahan and Representative Jim Cooper (D-TN), Chairman of the House Armed Services Subcommittee on Strategic Forces. Later, at 5:00 p.m., return to CSIS for a discussion hosted by CBS News legend and CSIS Trustee Bob Schieffer on China’s rise, focusing on the change of China’s domestic governance model under the leadership of Xi Jinping and China’s growing technological leadership. And, at 3:30 p.m., the Stimson Center will host a discussion on the challenges posed by the United States’ approach to airstrikes in Somalia and around the world, and the impact of these operations on standards for transparency and accountability. Last week, Todd Harrison, director of Defense Budget Analysis at CSIS, testified before the House Armed Services Subcommittee on Military Personnel. He summarizes his testimony on improving military recruitment and retention in the latest installment of our “Testify” series. Watch the full video here. So how tight was AC/DC in ’78 before lead singer Bon Scott’s passing? See for yourself.